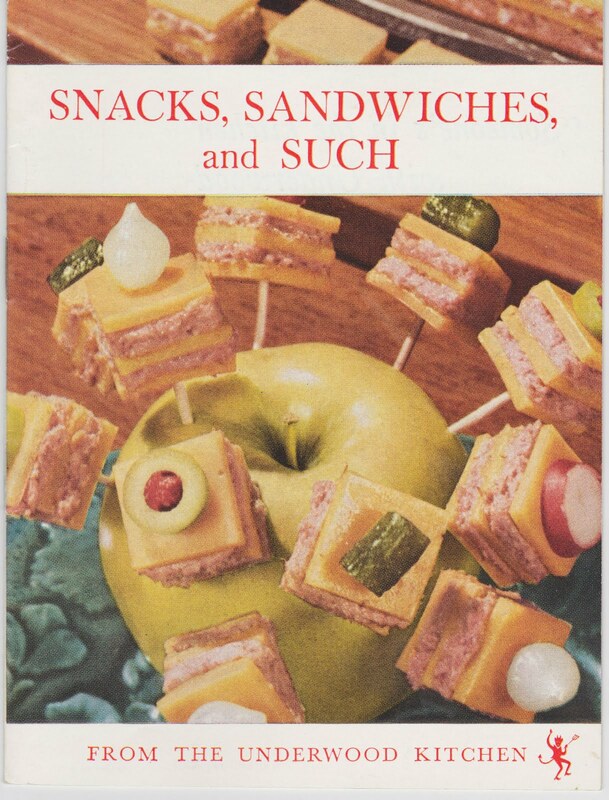 On the heels of the Underwood Deviled Ham post from March1, here's another piece of ephemera from the William Underwood Company -- an undated, 12-page recipe booklet titled "Snacks, Sandwiches, and Such." "IT'S THE 'HANDY HAM' that's so deliciously good and so easy to use for sandwiches, snacks, and for ham-and-egg or ham-and-cheese favorites. "AND DID YOU KNOW ... that in making Underwood Deviled Ham, we actually grind whole hams extra fine, then add a subtle whiff of seasonings which accent that smoky ham flavor. That's why Underwood Deviled Ham has a wonderful home-cooked aroma and goodness." 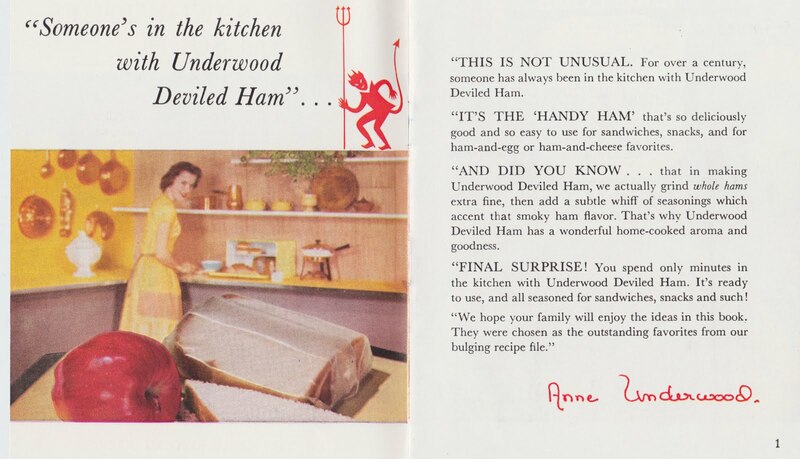 The booklet also makes the following bold statement: "Children love Underwood Deviled Ham with peanut butter." I did find another vintage advertisement that also touts the possibilities of deviled ham and peanut butter. But have you heard of anyone eating and enjoying that combination? I'm going to need some reports from the field. In the meantime, here are a couple of recipes from the booklet. Combine ingredients and fill centers of small rolls (scooped out). Heat in 350° oven 10 minutes. Serves six. Slit 4 frankfurter rolls. Spread with mayonnaise. 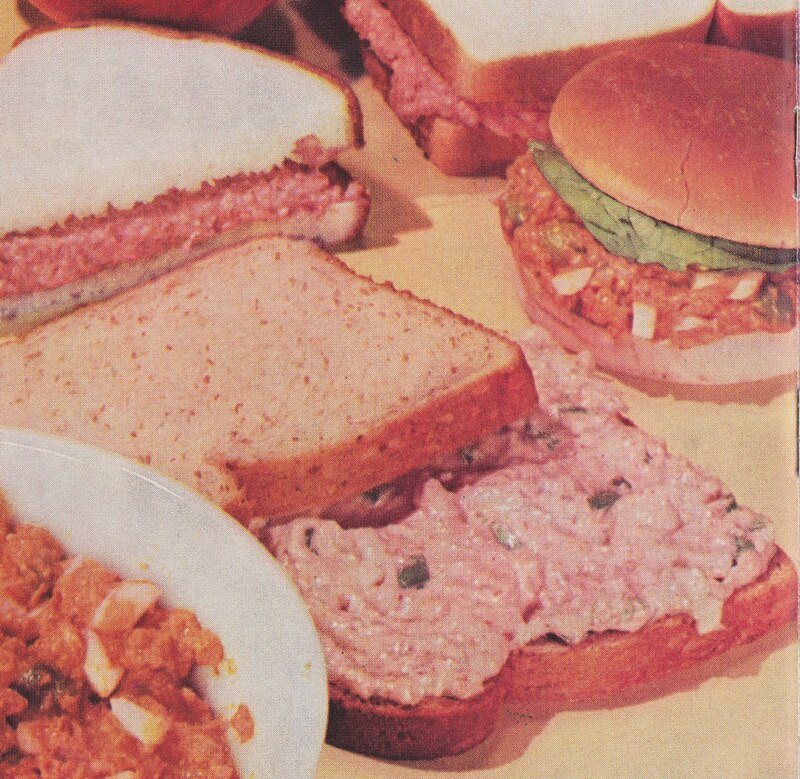 Fill with a layer of Underwood Deviled Ham, a long thin strip of dill pickle, a strip of cheese, and another layer of Underwood Deviled Ham. Brush outside of rolls with melted butter and grill on both sides. Every day's a picnic with these hammed-up hot dog rolls, whether you're eating indoors or out! 1. While out doing the grocery shopping and looking at canned meats yesterday, I was telling Joan about how the original Underwood Deviled Ham post was one of my favorites, partially because of the long tangent about "Canned Meat, Fish & Bugs From Around the World." I said I'd love to do a series about unusual canned meats from around the world. "Would you eat them?" she asked. "Well, I'd try them, at least," I responded. I worry my wife a lot of the time.